Probably the smallest strain of the Abyssinian subgroup used for draught and milk; humps are small and coat colour is mainly red; horns are small to medium. Found in Goffa area, principally around Sawla in South Omo. The Small East African Zebu are believed to have descended from the recent introductions of zebu into Africa from Asia, and some may have ancestral linkages with cattle of the Large East African Zebu group. The breeds or strains that belong to the Abyssinian Shorthorned Zebu group have tribal and ecological origins, which do not necessarily imply genetic differences. Distinct from cattle of the large zebu of East Africa, the small Abyssinian Shorthorned Zebu inhabits the higher altitude, wetter agricultural areas, and hence they are also referred to as Ethiopian Highland Zebu. 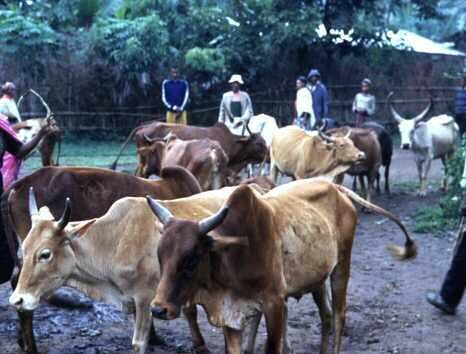 The Goffa is one of this on the wet and warm south-western highlands of Ethiopia, around Goffa (Rege and Tawah, 1999).